As I mentioned a few days ago, we’re working hard at our house on a new curriculum/ebook called Teaching Your Kids to Cook. Just like Learn Your Letters, Learn to Serve, this has become a family project. I’m the one writing it, but all the kids get to be a part of putting this all together (and posing for pictures), which makes this task so much more fun! 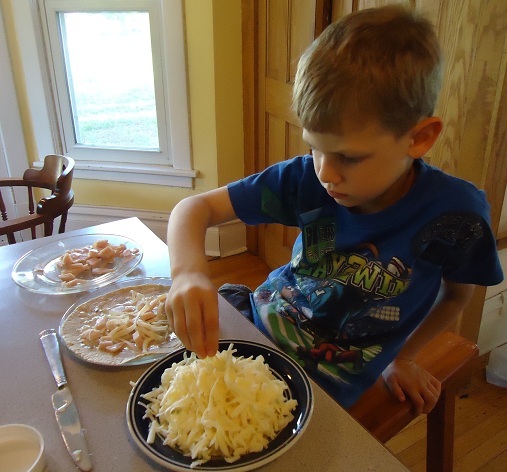 Malachi (age 6) was eager to help me try a new “recipe” idea – one that requires no cooking – just a little bit of spreading, rolling and sprinkling. In the middle of summer, any recipe that requires “no cooking” is a winner, so we decided we’d give you a sneak peek into this recipe before the book is completed! Spread Ranch Dressing on each tortilla. 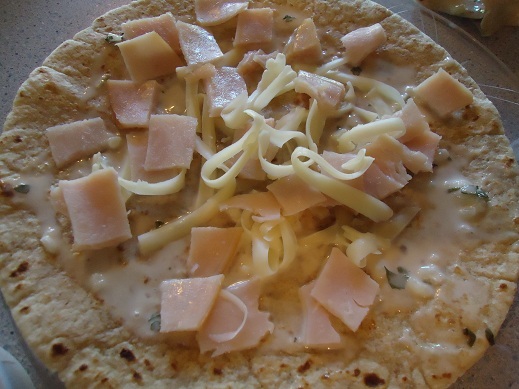 Sprinkle bits of cheese and turkey over the ranch covered tortilla. See what a nice job Malachi did! 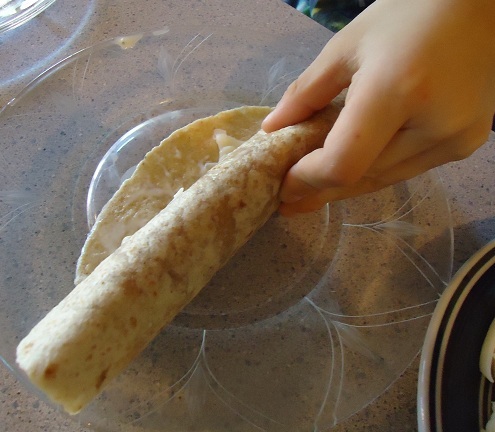 Roll the filled tortilla up as tightly as you can. 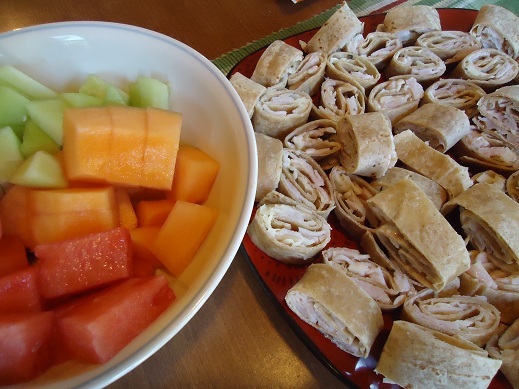 Malachi was so excited that he “made dinner for our family” and he declared this to be the “awesomest dinner ever!” It’s true – these Turkey Ranch Pinwheels were super easy to put together, didn’t require a stove or an oven and Malachi (age 6) was able to do most of the work all by himself (okay, not really, but sort of). We devoured this entire plate – and we had made a triple batch! Do your kids enjoy helping you in the kitchen? I know it’s usually easier (and less messy) to do the work yourself…how often do you pull the kids into the kitchen to help? Update! The book is finished – find Teaching Your Kids to Cook and Learn to Cook books here! What fun and it looks delicious! I love pinwheels but never think to make them. Great way to get the kids in the kitchen helping out. I need to remember to make pinwheels more often too. Malachi had SO much fun with this! Ha! Well, that’s the beauty of cooking – you can always tweak and experiment! Love love love this idea, just showed my son how easy and yummy they look ~ he insisted he’s going to make them for his lunch tomorrow. Perfect for VBS Day Camp this week! Thank you! I have an island in my kitchen so I can stand on one side while my 2 and 3 year olds pull up chairs and stand on the other side. Every time I bake I measure and they pour in, they stir, they taste test. 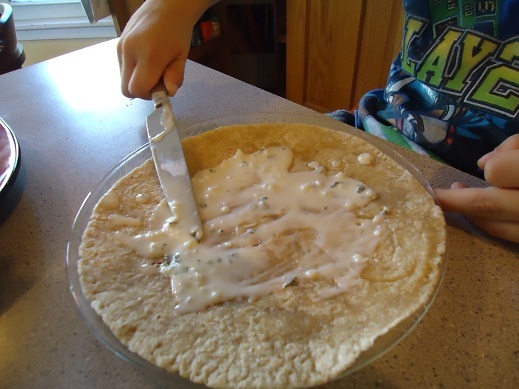 They love brushing the egg onto pie shells, rolling the rolling pin, pushing down the cookie cutters. It’s always a huge mess and more hassle, but they love it! Oh, and they especially love smelling all the spices :) A great way to teach them to cook! I LOVE your website as a 25 year old mother of 2 young girls and a wife to a hungry husband, I appreciate your approach to simple healthy eating. Anyway, how do you get your tortillas so soft. I make mine, but in order to roll them up, I usually microwave them to warm them first, otherwise they crack. Any suggestions?? If we make tacos (or pinwheels!) with fresh, right off the stove, they do great, which is usually what I try to do. However, sometimes it’s nice just to pull them out of the fridge and start making the food. In this case, I’ll rewarm them for a couple minutes in a skillet on very low heat. Love this idea! so far J likes to eat, not so much cook. But I’m hoping to change that and recipes like this may just do the trick. I have one note. Malachi looks old enough to be trusted with a table knife, right? I’m guessing he may also be old enough to cut the pinwheels (though with supervision of course to make sure they are all evenish). Hmmm…he’s six and I haven’t let my other boys use sharp knives until they were around 8 or so. Although he’d probably do okay if I was right there with him. And, a butter knife may be sharp enough to cut these, which I’d be okay with him using. 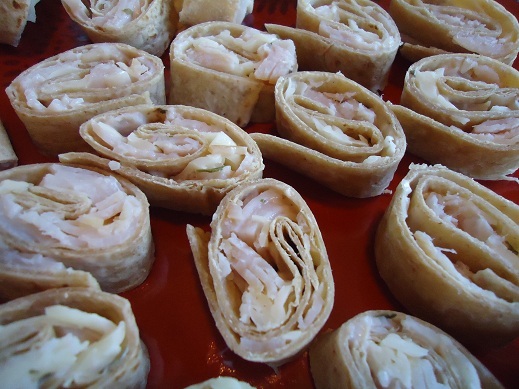 I will be having my 9 year old daughter help me make some of these today to use up some leftover chicken. I will also put in some fresh lettuce from the garden :-) I’m looking forward to seeing your new book! Laura, you have given me so much confidence to create a healthy & wholesome environment in my kitchen, I hope you realize how much we appreciate you! My 3 year old son likes to help me in the kitchen already, so I can’t wait to try this fun meal this weekend. He is only 3 and sometimes helps me slice (I use that term loosely) fruit with a table/butter knife. He is very dexterous for his age, though. His favorite thing to help me make is Pesto, because he is fascinated with anything green (which is GREAT!!). He helps with almost every part of the process, and especially loves to peel garlic cloves, which always makes him smell lovely (LOL!). I thought we would try making these pinwheels with pesto instead of ranch! What do you think? What a wonderful lunchtime idea too! My daughter is 2 and LOVES to help in the kitchen. She likes “doing dishes” (aka playing in the water), kneading bread, and sprinkling the cheese on our homemade pizzas. I think that she’ll have so much fun with this one. Thanks for the idea, Laura! All 5 of my children have enjoyed working in the kitchen with me. My two oldest, ages 14 and 11, pick one day per week where they are the “main” cooks for supper (we work with a monthly menu). The other three, ages 8,6 and 3, happily help out with prep tasks just about every day. They all have assigments each day of setting, clearing, wiping up, etc which helps them to learn that there is more involved in cooking than just setting out fantastic, healthy food. Its a joy to work together in serving our family this way! We love pinwheels in our house! We like to put shredded carrots and spinach in ours! Thanks for all of your encouragement! We make something similiar to these. We use cream cheese mixed with dry ranch dressing mix, spread on tortillas, fresh spinach leaves, turkey and shredded cheese. We’ve tried ham also. Both are really good. My oldest daughter(13) takes these for lunch at school a lot. 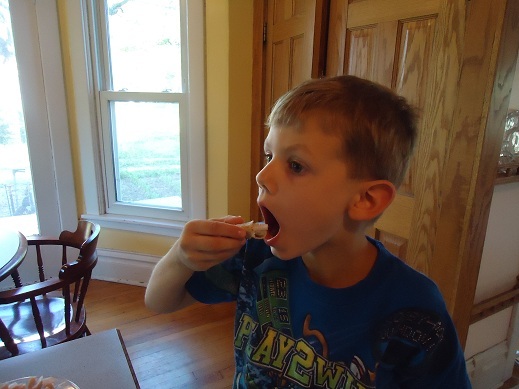 I realize not everyone likes spinach though(like my almost 11 yr old)so we’ve tried romaine. Good but spinach is reallllly good! Next time give him a spoon and tell him to spread that sauce just like when you make a pizza, it might make it even MORE fun. LOL Good job there, even with a knife. She’d probably love to make these pinwheels! I forgot about making these….Thanks for the reminder. My 9 yr old and 4 yr old made Monkey Bread today…I do the stove part while they do the rest. They love to eat it and make it! I’m always looking for age-appropriate things for the kids to do in the kitchen. I’m looking forward to your ebook!! I’m not sure. With the ranch in them, I don’t think they’d freeze very well.